Once I took a vacation with my wife to visit some of the interesting places in Argentine Patagonia—the Perito Moreno Glacier, the Petrified Forest, the Cave of Hands, etc. We decided on hiring a guide in a pickup that would wind us through Patagonia. Our guide was friendly and helpful. In-between the beautiful locations (mentioned above) most of Patagonia is windswept semi-arid desert, so for hours at a time we would only see tufts of yellow grass and scrawny bushes (xerophyte classification). Once in a while we would see a harrier, or a hawk, or a condor glide by. When we did see a tree or two, they where sticking out of the ground at a thirty-degree angle, because the strong year-round winds made the trees grow that way. Occasionally we would see a guanaco (an animal genetically related to an African camel and also but more phenotypically related to a llama, which is a smaller, hairier version of a camel), a hare, a snake slither across the road, or a herd of huddled sheep overseen by a lone gaucho sitting in a saddle on a horse silhouetted atop a hill, him and his horse leaning a little due to the wind. Otherwise, our first impression of Patagonia was that it is all but barren. The gauchos I saw looked ominous, hunched over in their saddles, puffing on hand-rolled cigarettes, staring at us with slit-eyed hatred as if we were something they were not or at the very least, intruders in their world. I didn’t understand. We were just tourists driving on a public (dirt) road. The guide told us “some gauchos are irresponsible, resentful, lazy, violent, drunkards.” But then he then added, “not all of them. Most of them were good employees, and good human beings.” I didn’t think much about those comments at the time. I just associated gauchos with the romantic notion of cowboys of the Old West in the U.S. of A.—riding in a saddle all day, sustaining for weeks at a time on jerky and coffee (by the way, gauchos drink maté—not coffee—which is a loose-leaf tea sipped out of a gourd through a metal straw). Anyway, most of the time on our trip, we stayed in one or two star hotels. We ate grilled meat and white bread three times a day. We travelled . . . ascetically . . . to say the least. One evening the guide invited us to his home to introduce us to his family. “It’s on the way.” He said. “Just a few miles from our tour route.” His house was set against a line of sand-beige foothills spotted with clumps of sparsely leaved green bushes and a few clumps of yellow grass. A few sheep and a couple of horses were wandering around and chomping on the grass. It was a humble abode, but well maintained and immaculately clean inside. His wife was very accommodating and good-natured. She cooked us up some lamb stew (guiso). They had an infant child who was lying in a portable crib set by kitchen table and gooed while we ate. We ate bowls and bowls of the guiso and sipped red wine and talked for hours. By then it was after sunset, so the couple showed us the guest room. It was just big enough for a small dresser and a twin bed, and since the only fireplace in the small house was in the living room, we slept with the door open. To keep us warm while we slept, the couple had placed 10 blankets atop the sheets (southern Patagonia can be very cold, all year round—did I mention that Patagonia was windswept? Yes I did. I forgot to mention that the wind is extremely cold, sometimes coming from over the snow-capped Andes, usually directly from the south—Antarctica). That was a romantic night for my wife and me, cuddled together in a small bed with a mountain of blankets over us. It was certainly memorable. We often talk and laugh about it. Sometime after, I read Nick Redding’s The Last Cowboys at the End of the World. 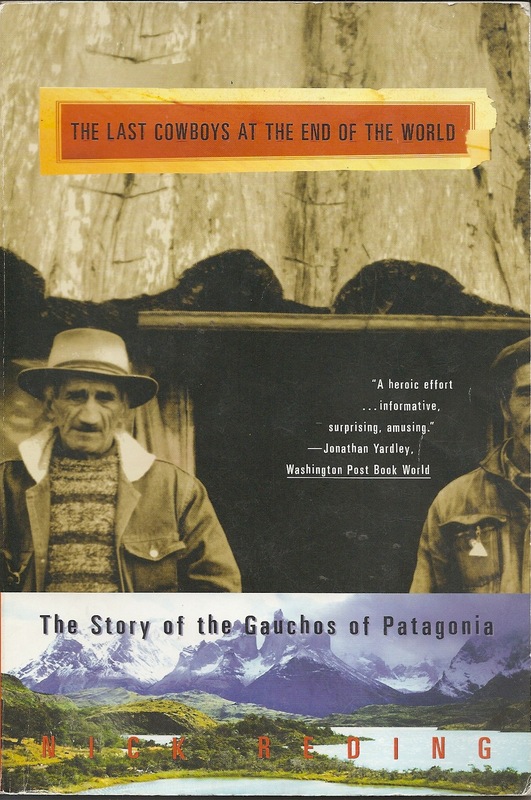 I bought the book just before I started studying at Bennington and read only part of the first chapter when a friend of mine, over a cup of coffee, in a Buenos Aires café called “El Gaucho,” explained to me the plot and the ending. I was, to say the least, perturbed. I decided to put some time between the book and me so I could read it somewhat unbiasedly. The Last Cowboys is a wonderful book. It has some tones of Chatwin, in the narrator behavior and voice, but in the end, overall, it is a unique story. The setting takes place on a huge spread of a ranch in the Chilean side of Patagonia (more mountainous than the Argentine). The main character, nicknamed Duck, whom Redding studies in the book is a gaucho, a family man (married and with children), and he is a hodgepodge of all the bad-guys in gaucho land—knife fighter, horse thief, cattle rustler, heavy drinker, wife-beater, philanderer, cuckold, malingerer, excuse maker, liar, irresponsible employee. Duck lives Spartanly—as do all romanticized gauchos and cowboys—but not because he wants to, because he has to, due to his inadequate salary. So, in order to live better, rationalizing to himself he deserves better for his family because the owners of the ranch he works on are rich, Duck sets up a system along with a few other gauchos from neighboring ranches, to “lose” a few head of cattle every time he moves the bovines from one pasture to another or when the big end of the year cattle drives are on. I won’t tell you if Duck gets caught or not, but there is a detailed chapter in the book that explains how difficult it is to fire a bad employee even if he is not working in the manor the employer wants (with the labor laws in effect at the time). The reader gets to know the inside story of ranching on a big spread—a dying entity in itself, what with feedlots and overpopulation causality. Reding shows Duck working, in home at rest, his family, his social life. Duck confesses to Reding his dreams, his thoughts, his heartbreaks and elations. To Reding, Duck’s cowboy/gaucho life is evolving (a most intelligent observation), and he explains why, not didactically, but through the actions of the main character. Reding puts together a great novel, filled with drama, action, excitement, everyday work drudgery, and romanticism of the Old West set in the present. I am glad I read it. You should too. I will quote something for you to ponder which Reding puts in the introduction: “if you can’t tell a story without maintaining the dignity of the people involved, you should not be telling the story in the first place.” I need to tape that to my computer screen. Stephen Page is from Detroit, Michigan. There he worked in factories, gasoline stations, and steel-cutting shops. He always longed for a vocation associated with nature. He now lives in Argentina, teaches literature, ranches, and spends time with his family.